As if Takenoko couldn’t get cute enough, now you can add Miss Panda and 9 panda babies to the base game with Takenoko: Chibis. Chibis adds new objectives, plot tiles, more pandas, and new landscape features to use and make sure the pandas are one big happy family. 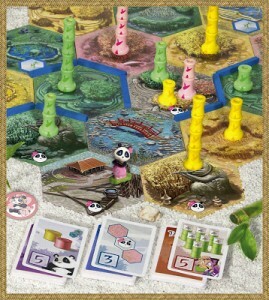 Takenoko is a game I keep meaning to pickup, but haven’t yet. Chibis may be the deciding factor in me picking it up sooner rather than later.